Take one glance at the media or PGA coverage of the Masters and you’ll notice that when it comes to being seen on the green, what you wear matters. Every golfer who took to the course in Augusta this year had their outfits scrutinised almost as closely as their play, but whether their attire set them up for esteem or ridicule, those guys were all playing the Masters, living the dream. 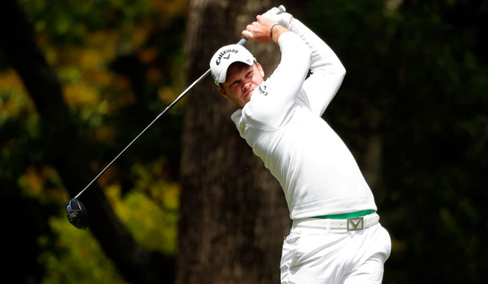 Opting for a largely understated and conservative look in whites, greens and blues, Willet’s wardrobe seemed relatively low-key. However, his apparently simple outfits belie the quality tailoring and technologically advanced designs that may have just helped give him the winning edge; as ambassador for Callaway Golf Apparel, Willet’s attire was engineered to perform beautifully. By pairing Callaway’s Lightweight Tech Trousers, which feature articulated knees and mechanical stretch properties, with a selection of their polo-shirts and trademark Chev belt, Willet was able to play with full range of movement and feel comfortable enough to focus on the game. Colour-wise, greens, navy blues and pale greys seemed to be the palette of choice, particularly for Spieth who was hoping to retain his championship, but players like Westwood, who finished the competition in 2nd place, gave an otherwise conservative wardrobe a modern edge with splashes of colour. 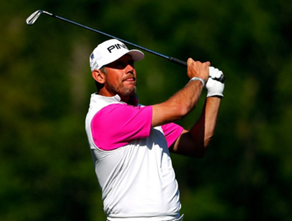 Self-confessed ‘big kid’ Billy Horschel opted for a somewhat playful look at the Masters in a bright pink polo-shirt paired with floral-print trousers, and he wasn’t alone in the colour stakes. 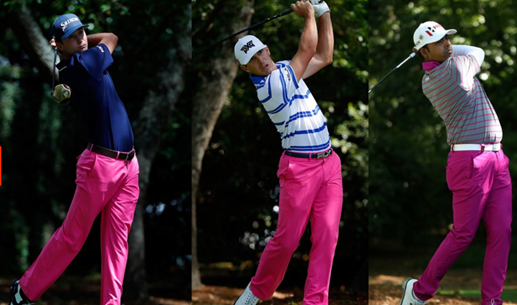 Smylie Kaufman and Anirban Lahiri were also seen sporting fuchsia pink trousers, which brands like Ralph Lauren, Nike and Stromberg are all including in their latest collections. Much like Callaway, these brands are popular with golfers because the structure and design of their apparel complements play. Nike golf pants, for example, are made from advanced Dri-FIT fabrics which draw sweat away from the body to keep players dry and comfortable for the full 18. Like them, with the right clothing you too can feel comfortable, confident and enhance your game, and maybe even establish yourself as a real contender on the course. You will, at the very least, escape the ridicule of your friends. You can get all the quality golf apparel you need to look the part, online from Function 18. Order everything you need and then get to the green to practice and play it too.